Hannah Kaminer’s career as a performing musical artist only began in 2014 when she took part in the Brown Bag Songwriting competition. The Asheville singer-guitarist earned a near-immediate return on her investment, winning both first place and crowd favorite honors. Her 2015 album Acre by Acre was produced by Julian Dreyer at Echo Mountain Studio, and Kaminer raised funds for the project through a Kickstarter campaign. A little more than a year after the release of that album, Kaminer was awarded a Regional Artist Project Grant; the grant – along with another extremely successful crowd funding campaign – allowed her to return to Echo Mountain to make her most recent album, Heavy Magnolias. This time around, Kaminer puts to use all of the knowledge she gained in the making of Acre by Acre; on Heavy Magnolias, she shares production credits with Dreyer. The production values on Heavy Magnolias are more finely textured than before, yet overall quite similar to those employed on Acre by Acre. But then there’s no reason to tinker endlessly with something when it works. And it does indeed work. Kaminer’s sweet songs are often tinged with melancholy and a soulful yearning; the song titles telegraph the mood even before the disc is removed from its thoughtfully designed packaging. While the instrumentation is note-perfect and sympathetic – especially Jackson Dulaney’s pedal steel – it’s Kaminer’s keen ability to paint word-pictures that remains among her greatest assets. With a writing style that walks a fine line between literal storytelling and deeply impressionistic lyricism, Kaminer manages to write songs that (one suspects) are very personal, but that nonetheless resonate with a wide swath of listeners. In the lyrics of “Just a Man,” Kaminer sings, “I know a man’s just a man / Just a man and you can’t / Make him what he ain’t.” She’s certainly not the first to make such an observation, but when she sings the words in her lilting, crystalline-clear voice with just a touch of Appalachian lilt, one senses that she learned the lesson the hard way. And so it goes with the other twelve songs on Heavy Magnolias. The arrangements of the songs are pleasantly varied, but once again, the instrumentation exists in clear service of Kaminer’s voice and words. The songwriter makes use of a slightly unconventional time signature for “Lost Boys,” a tune that is – despite its title – atypically upbeat, even playful. 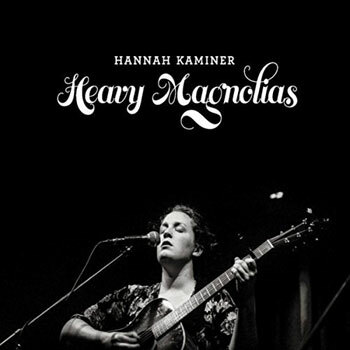 Both “City Song” and the album closer, “Set a Table” are commissioned works, illustrating – if the point even needs to be made – that Hannah Kaminer’s skills as a singer, songwriter and performer are so recognized that her supporters are ready to hear her new music even before she has written it. With the March 18 release of Heavy Magnolias, those supporters will be richly rewarded.